China Airlines Flight 140 from Taipei, Taiwan to Nagoya, Japan executed takeoff climb and cruise phases of flight uneventfully. While the co-pilot was manually flying the ILS approach to runway 34 at Nagoya, and descending through 1,000 feet, he inadvertently activated the go-around switches (also referred to as the GO lever) on the throttles, activating the auto-throttle go-around mode. This resulted in a thrust increase and a climb above the glide path. The copilot attempted to return to the glide path using forward yoke. Subsequent engagement of the autopilot while in go-around mode caused the trimmable horizontal stabilizer (THS) to drive the stabilizer towards its nose up limit as compensation for the manual control inputs via the yoke. The first officer continued his effort to maintain approach glide path with forward yoke, commanding the elevator in the airplane nose-down direction (opposite the THS driven by the autopilot system). Passing approximately 510 feet, the captain took control of the aircraft, which was now in an extreme mis-trim condition, and applied longitudinal control to the maximum elevator-down limit in opposition to the maximum nose-up stabilizer position. Unable to overcome the greater aerodynamic force of the stabilizer, the crew initiated a go around. On the application of go around thrust, the aircraft rapidly pitched up and airspeed steadily decreased. Correspondingly, airplane angle-of-attack (AOA) increased sharply. The captain was unable to arrest the climb, which continued to approximately 1,700 feet, and AOA increased until the aircraft stalled. Unable to recover from the stall, the aircraft crashed into the landing zone approximately 340 feet east-northeast of the centerline of the approach end of runway 34. Onboard the aircraft were 256 passengers and 15 crew members. 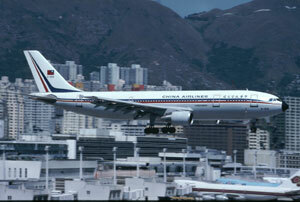 All crew members and 249 passengers were killed and seven passengers were seriously injured. Upon impact the aircraft caught fire and was completely destroyed.